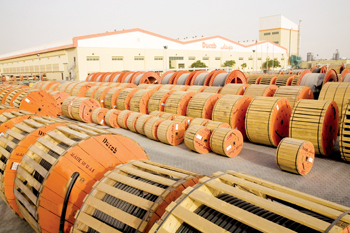 Ducab Aluminium Company (DAC), a joint venture between Dubai-based copper and aluminium wire and cable producer Ducab and Abu Dhabi industrial conglomerate Senaat, was inaugurated last month in Khalifa Industrial Zone of Abu Dhabi (Kizad). The firm will annually manufacture 50,000 metric tonnes of aluminium rods and conductors, with plans to export most of its output to overseas markets. Ducab is a joint venture between sovereign wealth fund Investment Corporation of Dubai and Senaat. “The UAE has become, thanks to the unlimited support from our wise Leadership to public and private sector entities, a leading player in industries such as aluminium and conductors and has built world-class factories and manufacturing facilities to meet the growing global demand for such industrial material,” commented Captain Mohamed Juma Al Shamisi, CEO of Abu Dhabi Ports. The new entity – DAC – set up at an investment of Dh220 million ($60 million) aims to boost the UAE’s industrial supply chain in line with the UAE strategy to champion industrial investments. It will manufacture electrical grade aluminium rod and overhead conductor per annum once it reaches its full capacity supplying to both local and international customers, said Senaat. The joint venture embodies the efforts to expand the development of the industrial sector in the UAE by embracing the partnership model that combines national industrial sector organisations in Abu Dhabi and Dubai. DAC co-operates with Emirates Global Aluminium (EGA) to supply the new manufacturer with molten aluminium in a collaborative model to promote partnership strategies among national institutions. One of the world’s leading aluminium producers, Emirates Global Aluminium, has welcomed DAC as the latest company to join the country’s aluminium sector and the aluminium cluster in Kizad. “The inauguration of DAC at Kizad, one of the region’s largest progressive industrial and logistic hubs fully integrated with Khalifa Port, offers DAC unrivalled advantages,” Al Shamis said. “Proximity of the DAC facility to major partners EGA, who are also based in Kizad and our anchor tenants in the aluminium cluster, is a clear advantage,” he added.